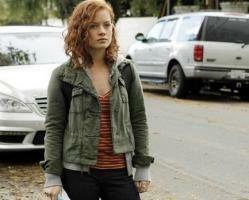 Suburgatory reviewed: new sitcom about a city girl in the suburbs. A city girl brings her deft condescension to the suburbs in Suburgatory. Still by Karen Neal, © 2011 American Broadcasting Companies Inc. All rights reserved. The sitcom Suburgatory (ABC, Wednesdays at 8:30 p.m. ET) began promisingly last week as the single father of a 16-year-old girl moved their little family out of Manhattan. The motivation? Back in the city, the dad (named George Altman and played by Jeremy Sisto) discovered a box of condoms in the room of the daughter (Tessa, played by Jane Levy). The box was unopened, but frowning on the girl’s pre-precautions, he decided that the best punishment was to drag her out of town. They pulled up stakes, and she reacted as if stabbed by a white picket. Their new community seems to be in New York state, a short distance from the Metro-North rail station serving Stepford, Conn.
George thought he was taking Tessa somewhere healthful and wholesome, which strikes me as slightly naive. True, statistics show that there are lower rates of sexually transmitted infections and teen births in Westchester County than in New York County, but George must not have considered such factors the dangers posed by teen driving and teen parking. Nor has he properly considered the city’s wealth of cultural institutions. Sometimes, by the way, the advantages of urban transit and high culture coincide. For instance, Manhattan is home to the Metropolitan Museum of Art, and at the end of a night of drinking 40s behind that building, teenagers can get home safely by hailing a taxi and throwing up in it. In any case, the suburbia of the show roils with more lust per capita than many a metropolis. When George visits an old pal at the country club, he gets hit on by a waitress named Jocelyn, who says that her specials include “an extremely tender local-farm-raised waitress named Jocelyn, served on a bed of your choosing.” It’s like Desperate Housewives getting played for arch zaniness instead of soapy camp. Tessa went off to her first day at her new school brimming with scorn for the women of this foreign land, who wriggle out of Juicy Couture sweatpants when stepping into the tanning bed. This scorn was written on her prettily sneering pretty face and coded in the anti-girliness of her army-surplus jacket, and Levy captured the deft condescension common among the New York expats quite nicely. Then Tessa entered the hallways, and her prejudices were substantiated. The person charged with acclimating Tessa to her new environment is a queen bee named Dalia Royce (Carly Chaikin), whose extracurriculars include gross conceit, varsity bitchery, and flat-ironing her yellow hair. “Dalia is your buddy,” said the guidance counselor. “Buddies are not your friends,” said Dalia. The word frenemies won’t do to describe the intensity of the burgeoning relationship between Tessa (an Angela Chase type in olive drab) and Dalia (a hot-pink Heather). Surburgatory requires the further portmanteau of frenemeses. At the start, their only common ground is cynicism. It is impossible to look at Hines’ character, with her teenspeak and hoochie-mama mothering, without thinking of Amy Poehler’s in Mean Girls, and, in general, this sitcom does not abound with fresh material, relying as it does on familiar tropes, some established the day after sod was laid in Levittown. But what Surburgatory lacks in novelty, it compensates for with a steady stream of gags, splashes of nuance (and nuance’s vivid opposite), the comedic flow of Ana Gasteyer and Chris Parnell as the Altmans’ neighbors, and an undercurrent of sweetness. The show is really about Tessa’s initiation into womanhood. The suburbs are just a stage set. Tessa’s experience of purgatory must only be temporary. What is purgatory? It is the state of those who die in God’s grace and friendship but are in need of purification before they can enter the joy of heaven. In this case, “heaven” would seem to be “college.” In any event, we can, according to Catechism, help Tessa on her journey by alms-giving, prayer, and fasting. In that last instance, we will be following the lead of Dallas and Dalia, who seem to subsist on Red Bull.